Rivers and creeks played an important part in the development of our country. Many of the pioneers, as they pushed westward, followed the streams either by foot or boat. They built their homes on the banks of the streams for it was waterpower that ran their grist mills and [was] a means of transportation. Among the first settlers in this vicinity were a group of men from Philadelphia, who were attracted by the pine forest on the banks of the Tunkhannock Creek. The trees were cut, sawed, rafted and floated down the creek to the river and on until a market was found, often going as far as Baltimore. Traders came up the river from Harrisburg, first in canoes and then later in Durham boats, and traded salt, molasses, gunpowder, lead and iron for furs, skins, venison and fish. Shad was very plentiful in the river at that time and a bushel of salt was a fair exchange for 100 fish. Deer and bear furnished meat for the pioneers and clothing was made from skins and homespun. Johneycake was the prevailing bread, so as long as ammunition lasted they were quite secure. The first means of crossing the river was by fording in the shallow places. 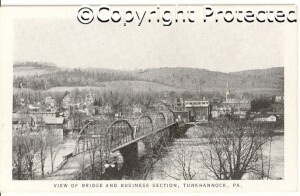 Next came the ferry and in 1835 the Tunkhannock Bridge Company was formed. It took until 1854 (19 years) to obtain money and state aid to build the first bridge. It was to be a covered wooden structure, resting in stone piers, 810 feel long and 30 feet wide. The superstructure was destroyed by a gale in August of that year and the Bridge Company folded but reorganized the next year. The bridge was completed in 1857. This was a toll bridge and operated successfully for eight years, then an ice flow swept away two spans and a pier. It took three years to ready it again for use and seven years later it was damaged by another ice flood. It was repaired and to date had cost $45,000. (Pictures of the bridge and the flood of 1865 are in the Daughters of the American Revolution brochure of “old” Tunkhannock.) It was 27 years [later], in 1902, when it was destroyed by another flood and a new bridge was built. That was the base of the present one .